Welcome to the analysis of Hannibal. Buttons at the bottom of each post enable navigation through the parts of the analysis. Regarding the appearance of possible anti-Semitism on this blog, please see the 'Disclaimers' section near the bottom of this page. In part of Hannibal, Hannibal Lecter, and inspector Pazzi and his wife, see an outdoor opera in Florence, Italy called Vide Cor Meum. This opera is based on the sonnet "A ciascun'alma presa", in chapter 3 of Dante Alighieri's La Vita Nuova. Hannibal Lecter (who has taken on the name "Dr. Fell") converses with the Pazzis after the opera performance. At the opening of chapter 3, it has been nine years since Dante has seen his beloved Beatrice. Beatrice appears to Dante at the "ninth hour of [the] day (3 o'clock in the afternoon)." A vision later appears to Dante "in the fourth hour of the night; that is, it was without a doubt the first of the last nine hours of the night." The second part of the sonnet begins, "The first three hours..."
Dante's uses of the numbers 3 and 9 in his sonnet, point to the concept of the Christian Holy Trinity, which is composed of three persons. Therefore, in Hannibal, the showing of an opera based on this sonnet is itself a reference to the Trinity. We will begin to look at the Holy Trinity in the next post. 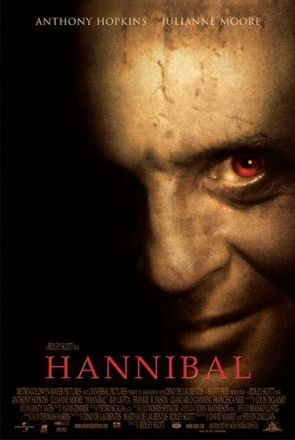 a. Poster for Hannibal: The poster art copyright is believed to belong to the distributor of the film, MGM / Universal, the publisher of the film or the graphic artist. b. Wikipedia, 'Hannibal (film)'. Web, n.d. URL = https://en.wikipedia.org/wiki/Hannibal_(film). c. Dante Alighieri. La Vita Nuova. Trans. with introduction Mark Musa. Oxford: Oxford University Press, 1992. pp. 6-7, 86.